Worth 2 VP + 1 VP per Project you have bought. Setup: Add a Project to the kingdom. Clarification: The added Project is in addition to any other Landscape cards in the kingdom. So if there are two Events before adding the Project, the maximum value for Oil Painting will be 3VP. If there are two Projects before adding the extra Project, the maximum value for Oil Painting will be 5VP. I also feel like it's fairly likely you will buy an available Project so this will usually be at least a Duchy, for $4. I like this except for its lack of flexibility. In Kingdoms without a decent sources of virtual Coins you need Silver and Golds and this forces you to discard all of them. This is why I'd rather try: Discard any number of cards, revealed. Worth 1VP for every 3 Coffers (round down) on your Coffers mat at the end of the game. Go to the Stock Exchange to invest, and as long as you can hang on to those investments, the more this is worth. I'm still working on the cost and the Coffers-to-VP ratio. Right now, with no other Coffers gainers in play, you'll need to play Stock Exchanges five times to make it worth as much as a Duchy. However, it could potentially get pretty nutty with good Coffers gainers in play, like Merchant Guild. May bump it to 1VP per 4 Coffers (or 2VP per 7 Coffers). Will try to playtest if I have time. I am actually thinking about a similar idea (vp for 2 villagers), but a problem is the temptation to keep building which makes it a boring long game. I will probably make it trash victory cards to give it an indirect limit. You could even consider a direct limit, e.g. "Worth 1VP per 3 Coffers tokens you have (round down), but not more than 5VP." 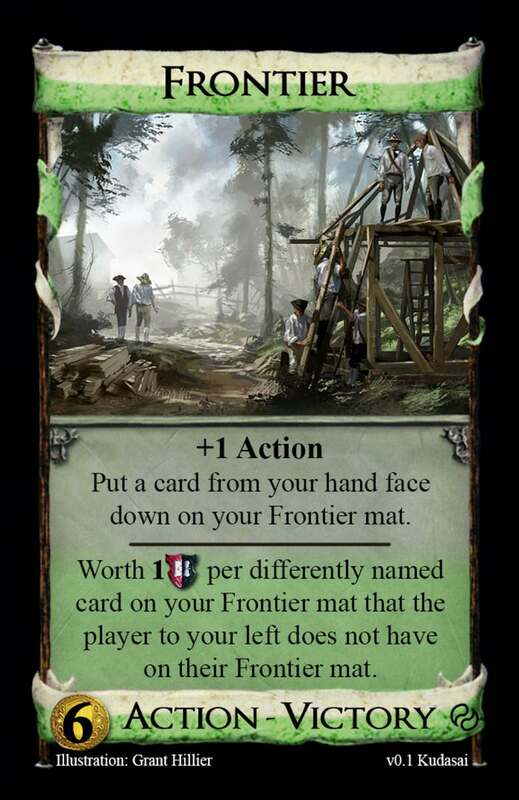 -Players can look at the cards on their Frontier mat at any time. -All players reveal their Frontier mats at the end of the game to determine what they are worth before taking those cards for scoring. A minor nitpick, and certainly not necessary for a fan card, but how would this work in ShuffleIT in games where you can see peoples’ VP? I feel some of this card’s weakness comes from the fact that you don’t know how much it’s worth until the end of the game and it would be too powerful otherwise. , though that depends on how you want the card to play out. That's a very good point. Let's say that in the hypothetical world where this is available as a promo, it comes with an extra set of cubes. If it’s a victory card, +2 villagers. This could get quite silly with Recruiter. 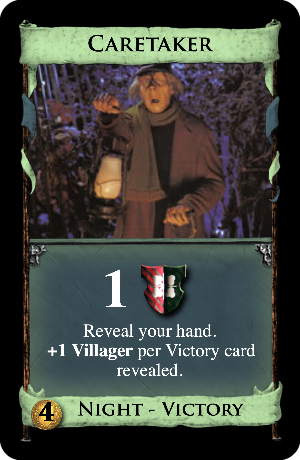 The other official Villager cards probably work fine with it, but Recruiter... oh man. It is certainly a Powercombo, but I don’t think it makes the game a silly one. Going for the split and building an engine simultaneously isn’t trivial. Imho, it’s not a problem if a card is a dominant must-buy under certain conditions. E. G., i wouldn’t call hermit poorly designed just because of its mindblowing synergy with market square. I think this doesn’t make it unbalanced or OP. 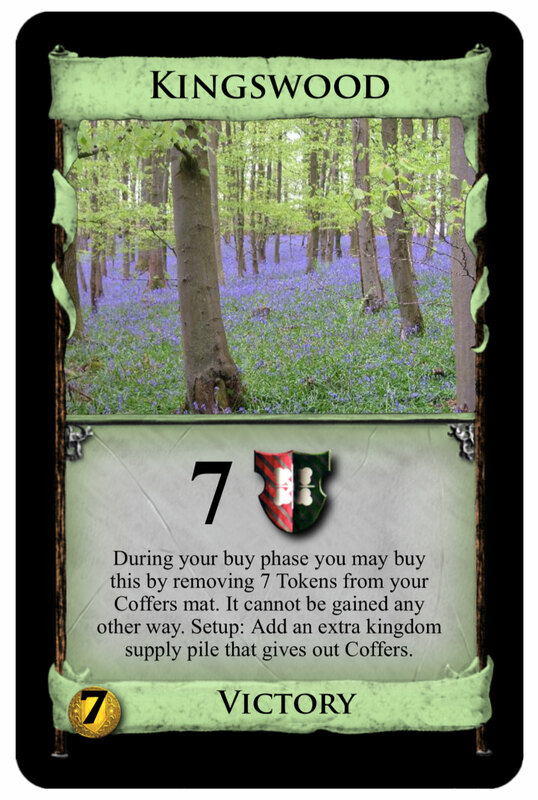 In my opinion a simple benchmark to understand the card is: use this to trash your 3 Estates, don't spend the Villagers, then these are Duchies. You can gain Estates and later trash them to make this worth more, but you can also spend the Villagers to run your engine which makes this worth less. I like it a lot and as you said, being strong with Recruiter doesn't break the card (as you have to gain cards to feed Recruiter there is also no loop potential unless Fortress is also in the Kingdom; and 3-card-loops isn't something one should lose any sleep over). Otherwise you'd also have to argue that e.g. University breaks Vineyard. Also, Recruiter is already pretty crazy in and of itself so Recruiter being crazier with another card has probably more to do with Recruiter than with Subversives which is a wild shot in Kingdoms with decent trashers. One common omission in fan cards is specifying where cards must be when you use them. If a card's effect is to "Put any number of Treasure cards on top of your deck," where do those Treasure cards come from? From your hand? From play? From your discard pile? From the supply piles? It may sound pedantic to require this to be specified explicitly, but since different cards look for things in different places, the clarity is important. Where are these cards trashed from? The supply? Your hand? The top of your deck? Your discard pile? Can I post more than one idea? Cause I have one that isn’t in the supply. That can only be gained by an action that is in the supply along with a state type card. Dude, were you there for Violet CLM’s “other board game” challenge, I posted like 5. You have to pick one of them to be your official submission. Submitting more than one isn't fair because it increases the odds you'll win. That’s why I asked. Cause I wasn’t sure. From your hand. I edited it, thanks for the remark. I agree to this, "See what sticks" shouldn't be an acceptable approach. But I have no problem with people sharing fun ideas they had inside the contest's context (say that fast three times), as long as it's clear they aren't submitting more than one idea. I will take you up on this offer! I wanted to create a Victory card that interacts with Villager tokens, but there are quite a few of those already. I think the Coffers/Villager Victory card idea can work, but I believe it has to be tied to some physical card that takes up room in your deck. Otherwise, the Victory card can become worth quite a bit for really no ill effect. Also, I think conditional token gaining could work in a way. Anyways, here is what I came up with. The values are likely off. Any feedback from anyone is always appreciated! This indirect usage of Villagers is a very cool idea that avoids outright brokenness via endless token accumulation. Outskirts doesn't really support your terminal-heavy engine as it will most of the time be a Ruined Village. Sure, sometimes you can save superfluous Actions but this very slight increase of engine consistency comes at the significant cost of having to play a card. This is why I think that it has to provide 2 Villagers to become a proper village that you can actually use. The fact that it doesn't draw will still hurt and the VP this provides are fewer than those of Vineyard so it shouldn't become too crazy. Great payload potential but with deceptive snags, mainly with how Chef loves Gold and Platinum but Pheasants aren't going to get them so it'll be awhile before you do. Nice, but double Pheasant opening could be automatic in some games, almost like Quarry at $3 with an extra Buy; my main concern is the strength of this in building speed, despite the later game setbacks. I definitely put Pheasant at $3 so that Chef would commonly be uncovered. The question really is if piling Pheasants immediately will typically be the right thing to do because of Chef's combo with it, and if doing so doesn't result in an interesting game state. I was focused on the complexities of building with Pheasant and then timing throwing them away (with Chef particularly) moreso than the question of whether or not your want to buy Pheasant. I mean, you don't usually ask if you want to buy Goons either. A bump up to $4 might be better for the health of the game (especially since that would make Pheasants will be more limiting for buying other Pheasants), but I'd err on the side of too little before too much. Also, it's a bit much to consider Pheasant like Quarry at $3 with an extra buy. Quarry with a +Buy sort-of provides +$5 for buying Actions, while Pheasant is +$3 for only Actions no matter what. Worth 1VP per different cost of the cards in your deck. In order to buy this, you need 2 Buys. The different costs guarantees this is worth 7VP. It becomes 8VP with a $4 Kingdom card, and everything else is edge cases. I'm not sure how much I like it because, like Fairgrounds, it adds so many more VP to the board that it can make games seem endless. Any other consideration aside though, the Heirloom reuse is clever. Worth 1VP for every 2 tokens on your Villager mat more than the player who has the fewest tokens on their Villager mat (rounded down), but at least 1VP. Setup: Each player gets +5 Villagers. This may cause endless games, e. g . with Necromancer and Acting Troupe. Necromancer\Acting Troupe\Paper Mill Sounds more circuitous than Bishop\Fortress, Bishop\Graverobber, Bishop\Lurker, Bishop\Rogue, Bishop\Treasurer, Patron\Paper Mill, and, well, Monument. Paper Mill only increases in VP if you can outstrip another player's +Villagers. If there is no way to produce +Villagers, then Paper Mill provides +3 Villagers for free, and you can still use the rest of the Villagers if doing so allows you to end the game. Otherwise improving other players' Paper Mills from 1VP to 2VP probably isn't typically worth +2 Villagers. I'd consider having Paper Mill produce Villagers in some fashion, but that could give it a fairly dull play pattern in comparison to the dynamism of depending on other Villager producing cards and otherwise being an odd free source of +Villagers. I feel like everybody doesn't like Coin of the Realm. This tastes so similar that I'm not a fan. At the end of the game, just before scoring, players with Construction Sites may exchange them one at a time in clockwise turn order, beginning with the player to the left of the player whose turn the game ended on, for any card in the Supply. Ignoring any wording issues, I've played with effects like this before (called them End cards that were played in a special End phase). It's a fairly limited shape of thing with a complex rules overhead, so I ultimately dropped the concept. This probably has big scaling issues since 4-player games so commonly end on piles. You could probably simplify this as 2VP per Project you have bought. It might be more compelling if it was worth 2VP per Project you haven't bought, but then it would be worth 6VP in games with 3 Projects, which probably isn't reasonable. Somewhat amusingly, the rules are more explicit about you having 2 cubes for Projects than playing with only 2 Projects. I wouldn't recommend changing that. +1 Action. Put a card from your hand face down on your Frontier mat. Worth 1VP per differently named card on your Frontier mat that the player to your left does not have on their Frontier mat. The cap of Frontier is typically 16VP, but it will definitely be dragged down by the Scattergories thing. My big concern is the left-right binding here. Possession and Smugglers' turn order issues have nothing on Frontier's. I'd much rather it care about the "differently named cards that no other players have copies of on their Frontier mats." I wouldn't worry about the "outright brokenness via endless token accumulation" unless the card itself is a great source of tokens. 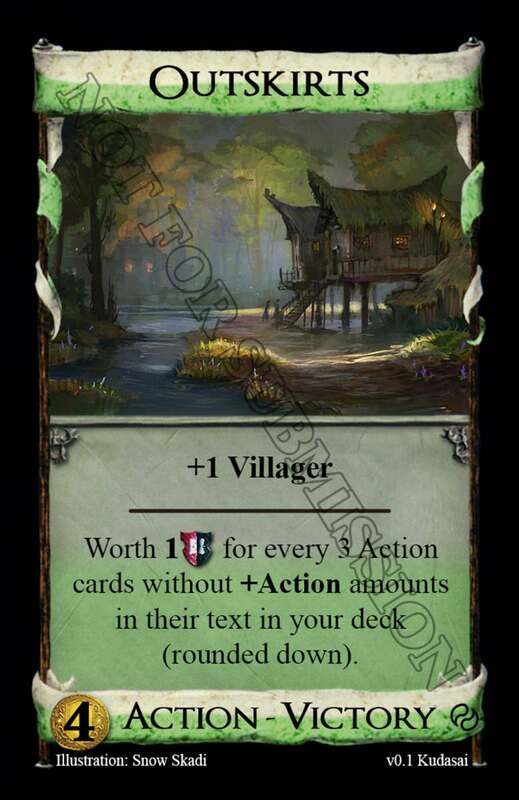 The only non-combo infinite sources of +Villagers are Exploration (which is super slow) and Patron (which reads very similarly to Monument if there is a card that cares about the number of tokens you have on your Villager mat), and anything that is a 3-card combo has plenty of 3-card combos with which to contend. Worth 1VP for every 3 Action cards without +Action amounts in their text in your deck (rounded down). This ought to be 1VP per 4, to avoid comparing too well to Silk Road. When you gain this, +3 Villagers, and each other player gets +1 Villager. Simple like Renaissance, and obviously Villagers. Also, a lot of cards in Renaissance had on-gain effects, so there's that too. Is City Hall a medievalish name? Is City Hall a medievalish name? The "strictly medieval" theme was thrown out long ago, particularly with Empires. At this point, the only rules are no guns, steam or electricity. I feel like everybody doesn't like Coin of the Realm. Wait, who doesn't like Coin of the Realm? Yeah, I love that card.